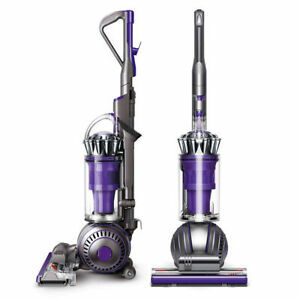 ★★★★☆ Overall a great vacuum. Plenty of suction, probably due to the fact the main brush has its own motor. This leaves the inboard motor to handle the suction only. Handles multiple surfaces and transitions between them quite nicely. Easily maneuverable with the ball, although the motor mounted to the top of the head limits reaching underneath cabinets and other things with overhangs near the floor. The nice assortment of hand tools makes it easy to reach those places the main brush can't, however. The long wand is great to reach stairs and things on the ceiling. I like that I can handle all the vacuuming jobs with this one unit. Very easy to empty. Only taking off one start because I'm not sure how well the plastic construction will hold up over time. It's a good vacuum that's pleasent to use. ★★★★★ Wonderful vacuum. Worlds better than previous vacuum purchases. Received refurbished and surprised to find what appears to be a brand new vacuum. Would recommend to anyone at this price point. ★★★★★ I was a bit skeptical to buy a refurbished vacuum at first because I wanted something that I knew would work, and this product really impressed me. It works like it’s new at a great price. It picked up so much dirt and dog hair after just two uses. I use it on both my hardwood floors and carpets with ease. ★★★★★ After 10 years our old Dyson died; we got an Animal 2 from the Dyson outlet. After 1 week I can say that this new model has several improvements over the DC16, which makes it even better. ★★★★★ Easily my favorite Dyson upright among the many I've owned. Extremely powerful suction with a strong agitator that does a great job grooming the thick carpet in my house. I have long-haired Yorkies and their fine hair ends up in the bin instead of wrapped around the brush bar. Unlike the Cinetic, the UP20 is very easy to maneuver on any surface. It's even lightweight and maneuverable enough for me to use on the stairs without deploying any of the tools. The cleaner head has superb edge to edge cleaning and is just the right size and height to clean under toe-kicks and corners. The bin is one of the better designs I've seen from Dyson, I no longer have to reach into the bin to pull out the lighter fluff and hair that use to get stuck higher up in the bin. Something that takes getting use to even for a Dyson owner is the act of uprighting the machine. It's a little confusing at first since it needs to click in twice even if the first click seems to be upright. You'll get use to it but I've dropped the machine backwards a few times not realizing it wasn't locked in even if it felt like it was. Overall, definitely Dyson's best combo of strong agitation and powerful suction in a relatively lightweight and maneuverable package.